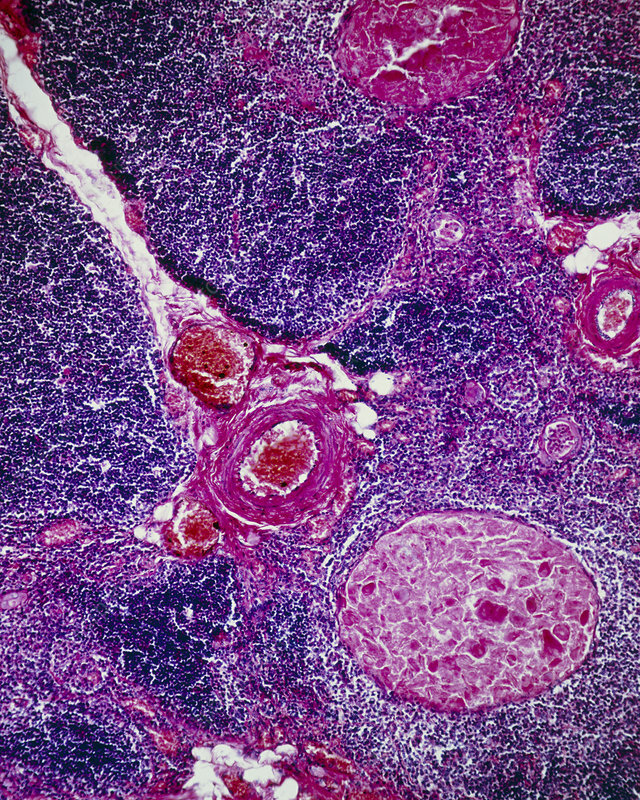 Light micrograph of part of a normal human thymus. The thymus is divided into lobules separated by septa of connective tissue (white spaces) which may contain blood vessels (examples at centre and far right). The body of the thymus is divided into an outer cortex (ink blue stain) and inner medulla; the medulla is less densely packed with lymphocytes. The pink, circular features within the medulla are called Hassal's corpuscles, obscure cyst-like structures that may represent degenerated epithelial cells. The thymus functions to produce mature T-lymphocytes, which migrate to the general circulation. Magnification: x80 at 6x7cm size.